He was accepted in 1915 and became a member of the famous ‘Lafayette Escadrille’, flying Nieuport biplanes. The memoir describes the life of the pilot – quite a luxury compared to the front line soldier – but this was no easy posting. Flying was still in its infancy and the technology new and basic. The pilot’s life was fraught with danger, and McConnell himself was injured in a crash landing. It was during his convalescence that he penned ‘Flying for France’. 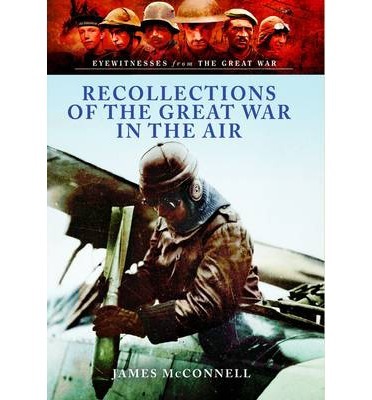 McConnell writes vividly about the war in the sky; flying at 13,000ft over Verdun he offers a detached view of the carnage below and describes how pilots had certain disconnection with the war going on below them. He describes the tactics of air warfare, and how a rota system was operated so that there were always planes in the air. Two hour sorties were standard, mainly patrols, although on one occasion McConnell accompanied a bombing raid into Germany itself. He also writes with candour about the fate that could befall pilots, and ways in which his comrades met their demise. This was certainly a form of warfare not for the faint-hearted. Whilst the first part of the book is McConnell’s own recollections, the second part includes letters he wrote and a brief account of pilot training. The book is concluded with some final letters relating to the circumstances in which McConnell lost his life in the skies above St. Quentin in March 1917. Whilst the book includes a brief introduction, some additional contextual information would have been beneficial. However the memoir and letters give a surprising amount of detail about the pilot’s life and tactics employed. McConnell’s story is certainly an interesting one and this is a short and easily digestible introduction to the life of a First World War pilot.